This executive policy (“EP38” or the “Policy”) is the University policy on disclosure, inventorship, ownership, management, and disposition of intellectual property (IP) created using University resources, which includes, without limitations, employee time and the University’s preexisting IP. This Policy is to be read consistently with the Washington State University (WSU or “University”) Faculty Manual provisions on IP. If there are inconsistencies between the Policy and the Faculty Manual, the Faculty Manual prevails for faculty. Those covered by this Policy include all persons employed by the University, participating in University research, or who contribute to the creation of IP (such as patent, copyright, or trademark) under contractual relationship with the University, and/or dispute the inventorship or ownership of IP arising from University research, resources, or employment. Thus, EP38 applies to the entire University community, including, but not limited to, faculty, individuals on appointment at the University, administrative and professional personnel, classified employees, research fellows, staff assistants, volunteers, visiting scientists, student employees, graduate students and undergraduate students participating in University research, as well as others who contribute to the creation of IP and/or dispute the inventorship or ownership of IP arising from University research. A “student” for the purpose of this Policy is a current WSU student. For the purposes of this Policy, a University “inventor” or “author” is defined as any individual receiving compensation for service, or any individual volunteering services for the benefit of the University, who creates IP. An inventor is one who makes an intellectual contribution to the invention. An author or creator is anyone who makes an editorial or technical contribution to a creative work. A University “contributor” is defined as any individual receiving compensation for service, or any individual volunteering services for the benefit of the University, who does not qualify to be an inventor or author but participates in a manner, in the absence of which, University IP could not have been created. IP is the inherent value produced by human creativity and invention, protected by law from unauthorized exploitation by others, and includes patents, copyrights, trademarks, plant variety protection certificates, and other proprietary information. The uncompensated activities of students in furtherance of their education are not considered service that benefits the University subject to this Policy unless the students are being provided with opportunities to participate in sponsored research or University research beyond that incorporated into their course work, or when specific agreements exist that the University or some other entity will receive the IP created (for example in a sponsored capstone project where the sponsor is to receive the resulting IP). To the extent this Policy is consistent with the law, including but not limited to the Ethics Law, this Policy authorizes University employees to receive royalty payments from commercialization of certain University-owned IP created by the employees. Faculty may have additional rights under the Faculty Manual. This Policy also controls when a University author or inventor may retain the rights in IP that they created. The following federal and state laws apply to and are incorporated into this Policy. Trademarks are governed by both federal and state laws. (15 USC 22 and RCW 19.77) Trade secrets are governed by federal and state law (Defend Trade Secrets Act (DTSA) 18 USC 1832-1839 and Uniform Trade Secrets Act (UTSA) RCW 19.108). Public Employment law, including but not limited to Title 41 RCW, Title VII of the Civil Rights Act, Title IX of the Education Amendments Act, and the ADA (Americans with Disabilities Act). Washington State laws RCW 49.44.140 and RCW 49.44.150 govern the disclosure and assignment of employee’s IP rights to the state agency. See Sections II.C. and II.D. below. Section 42.52.220 of the Revised Code of Washington provides that the University may institute an administrative process to reduce, manage, or eliminate conflicts of interest of research employees that may arise from commercialization of IP developed from University research. See also EP27. The IP Committee is an advisory committee to the Vice President for Research on University intellectual property (i.e., patent, copyright, trademark, and proprietary information). Among other duties, the IP Committee provides a process for addressing internal disputes regarding IP ownership. The OC (commercialization.wsu.edu/) promotes the transfer of technologies by encouraging the disclosure of IP, conducting preliminary reviews of commercial potential of invention disclosures, determining copyright and patent protection, and licensing of IP. The OC manages invention disclosures, patenting, license agreements, marketing and new venture creation efforts, federal reporting, and royalty income. This Section of the Policy applies to any patentable discoveries, inventions, and proprietary information developed using University equipment, supplies, facilities, inventor time, or University proprietary information; or which relate directly to the University’s business, research, or development. University inventors assign ownership in patents and other inventions to the University. The University does not claim rights in inventions for which no University equipment, supplies, facilities, or proprietary information were used or which were developed entirely outside the scope of University employment. An invention may be a composition, design, process, code, biological material, or device that shows novelty, usefulness, and nonobviousness. Patents, plant variety protection, international plant variety rights, and international patents are various forms of invention protection. For further information about patents, refer to the U.S. Patents and Trademarks Office (www.uspto.gov/). Patent law provides that the inventor is the owner of their inventions absent a written agreement to the contrary. Royalties and other inventor services are in consideration of an assignment of an invention to the University. When an invention is developed through research sponsored by a grant or contract with the federal government, it must be reported to the sponsoring agency. The agency (a) joins the University to determine distribution of the rights in the invention; (b) determines if patent prosecution should be sought, and (c) administers and disposes of patents in the public interest. The Office of Research Support and Operations (ORSO) is responsible for the submission and acceptance of sponsored projects to the University. For further information, refer to ORSO’s home page (orso.wsu.edu/). When private industry or foundations sponsor the research, IP licensing is negotiated by the OC, between the sponsor and the University or the University’s designee. With exceptions, the University retains ownership of property developed under sponsorship agreements and negotiates rights to license the property. The proprietary rights of the University and of the University’s employees is subject to the agreement between the sponsor and the University or its designee. The Vice President for Research or his or her designee must approve agreements with outside sponsors. When employed by the University, faculty and other individuals who have prior patents or significant IP interests must disclose to the OC all inventions previously developed or being developed by the employees to establish the employees’ existing ownership rights. (RCW 49.44.150). Individuals should report prior inventions by memorandum rather than by invention disclosure form. Individuals must route the memorandum to the OC. The OC sends a copy to the Washington State Department of Employment Security (WSDES). While affiliated with or employed at the University, inventors must disclose patentable inventions and discoveries to the OC for review (RCW 49.44.150). The staff of the OC can provide assistance in filling out forms for disclosure. The OC examines each invention disclosure form to determine rights in the invention, such as those related to a sponsored grant or contract. This may include disclosure of the invention to the sponsor. The OC returns any incomplete disclosure forms to the inventor for the necessary additional information. If ownership is returned to the inventor, the University retains the right to use the invention in its normal teaching, research, and service operations if it was developed using any University resources; directly supervise development of the invention; or assign development responsibility to a designee or a University collaborator. Return the technology to the inventor or funding source, if applicable (retaining rights as discussed above). Royalties. See Sections II.H and II.I regarding division and distribution of royalties and other invention income. Under the federal patent and trademark legislation of 1980 (35 USC 200 et seq. ), the University has the right of first refusal to title in inventions made in the performance of federal grants and contracts. The University or its assignee asserts title to the IP in the invention and attempts to license the invention to further the congressional purpose of fostering the development of industry in the United States. For any patentable inventions and other discoveries in which the University, its assignee, or a sponsor has an interest, the University inventor must promptly execute assignments, waivers, and other legal documents necessary to vest in the University, its assignee, or the sponsor any and all rights to the invention, including, but not limited to, assignment of any issued patents or patent applications. Current and new employees and individuals on appointment at the University, who reasonably may develop intellectual property during the course of their appointment or employment at the University, are required to sign the IP Assignment form. Employees must upload the completed form to the website above and send the original to Employee Records and Compliance of Human Resource Services and a copy to their employing department. In most cases, the University owns inventions and works produced by University inventors and authors. Address questions concerning ownership to the OC; telephone 509-335-5526. The OC is responsible for determining ownership of IP produced by University employees. The OC uses the criteria in the table on the following page as guidance when determining ownership rights to inventions, creative works or trade secrets produced by University inventors and authors. University Produced by University inventor within the scope of employee duties. University Produced by University inventor. The invention relates directly to University business or to University’s actual or demonstrably anticipated research or development. University Produced by University inventor using University confidential or research trade secret or proprietary information. University Ownership rights released to University by an inventor or outside party by written agreement. Produced by University inventor partially or wholly with University equipment, supplies, facilities, or proprietary information and the IP Committee has determined that it would be unfair to determine that the property is wholly owned by either University or the inventor or author. Student Produced by University noncompensated student and none of the above criteria apply to invention development. Invention produced as part of a course work and no agreement provides otherwise. University Produced by University student in the capacity of an employee (e.g., paid assistantship, internship, summer employment, work for hire) or when participating in sponsored research or University research that is not part of course work. Employee Ownership rights released to employee by University or extramural sponsor by written agreement. Outside Party For outside party ownership rights, see the Faculty Manual, Section IV.G.2: Patent Policy — Sponsored Research. When inventorship and/or ownership is questioned, the OC determines whether the IP is owned by the University, by the employee, jointly by two or more inventors, jointly by the University and the employee, by a third party, or by an outside sponsor. If the OC determines that a third party has an ownership interest in the IP and that University also has an interest in the IP, the OC notifies the third party and negotiates percentages of respective inventorship and/or ownership. In such instances, if the OC deems it to be in the best interests of the University to release its rights to the invention, the OC may do so. 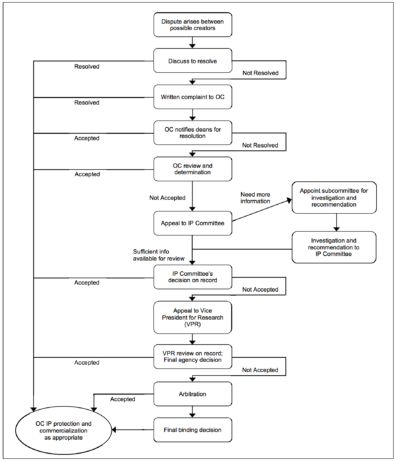 When a dispute regarding IP inventorship and/or ownership arises among the WSU faculty researchers, employees, graduate and undergraduate students, or others participating in WSU research, the procedure below is used to resolve the dispute. This procedure also applies to disputes regarding copyright and plant varietal disputes. The researchers or others involved in the dispute are encouraged to try and resolve the dispute among themselves prior to pursuing the procedure outlined below. If the dispute is resolved, the matter returns to the OC for IP protection and commercialization as appropriate (“standard processing”). If the dispute is not resolved, it moves forward with the procedure outlined below. To initiate this process, at least one party to the dispute must deliver, in writing, a request for dispute resolution to the OC Director. Within five business days of the receipt of the dispute resolution request, the OC Director notifies the dean(s) of the involved college(s) and requests that the dean(s) review and resolve the dispute, if possible, within 30 business days. If the dispute is resolved, the matter reverts to the OC for standard processing. If the dispute is not resolved, it moves forward with the procedure outlined below. 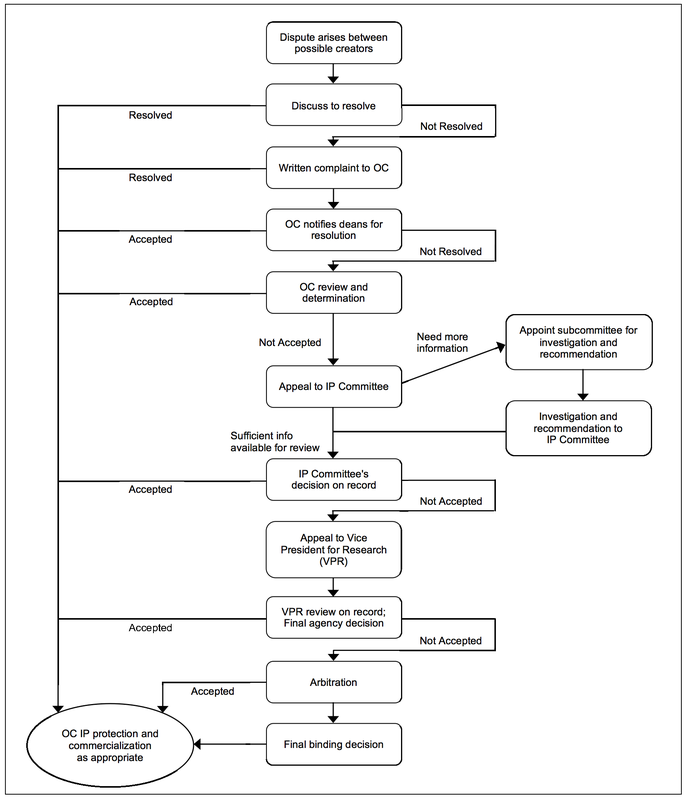 The OC Director reviews the basis of the dispute, which may include, without limitation, interviews, evidence obtained, and other available information, and makes a determination. The OC then prepares a written report which includes a proposed resolution and/or recommendations and a determination, and presents that report to the Vice President for Research. The OC Director must complete their review and determination of the dispute, or request additional time, within 45 business days of a dispute being returned to the OC from the dean(s). If the OC Director asks for additional time, the OC Director must make a determination within 35 additional business days, absent good cause for additional extensions. The Vice President for Research has the authority to grant extensions. Extensions should be for a limited time to facilitate prompt dispute resolution. Within five business days after receiving the report from the OC, the Vice President for Research must send written notice to the disputing parties of the OC Director’s determination. If the disputing parties accept the OC Director’s determination, the matter reverts to the OC for standard processing. If they do not accept the OC Director’s determination, one or more of the parties may send a timely appeal to the OC Director as provided in Section II.E.2.a below. When an appeal is received, the dispute then proceeds to the appeal procedure outlined below. If the dispute is not appealed in a timely manner, the matter reverts to the OC for standard processing. The disputing parties have 30 calendar days from the date the Office of Research mailed notice of the OC determination to deliver a request for appeal to the OC Director. The OC Director sends the appeal to the Intellectual Property committee (IPC). The IPC must hear the appeal within 20 business days of the notice of the appeal. The IPC makes a determination based on the hearings/interviews, evidence obtained, and other available information within 30 business days after the first IPC hearing of the appeal unless the Vice President for Research approves extensions for good cause. One member of the IPC from, or related to, the college/nonacademic unit from which the dispute arose, nominated by majority vote of the IPC; if no member of the IPC is from the affected college(s) or nonacademic unit, the dean or head of the affected college or nonacademic unit appoints an individual from that college or nonacademic unit. One member of the IPC selected from a college or nonacademic unit distinct from the college/unit where the dispute originates, nominated by majority vote of the IPC. Two faculty members nominated by the Vice President for Research, one from or related to the affected college/unit and one from a college or unit distinct from the affected college/unit. Associate dean for research of at least one of the affected colleges. One representative from a nonacademic unit nominated by the Vice President for Research. The OC Director and staff members may not be appointed to the subcommittee but may provide consultation and expertise upon the subcommittee’s request. The subcommittee analyzes the information available, gathers additional evidence as needed, and prepares a summary of its recommendation to the IPC. The IPC reviews the summary report and provides a decision of record to the Vice President for Research within 20 business days of the subcommittee’s report to the IPC. The decision of record must include findings of fact and a determination of the dispute. Decision is arbitrary and capricious. The Vice President for Research must review the record and issue the final decision (“final agency decision”) within five business days of receiving the appeal. Alternatively, the Vice President for Research may request that the IPC provide additional information to the Vice President for Research within 30 business days and after receipt and review of the additional information enter a decision within five business days, which then becomes the final agency decision. Following the completion of this internal appeal process, the disputing parties shall have recourse to settle inventorship and/or ownership by binding arbitration administered by the American Arbitration Association (AAA) under AAA Patent Arbitration Rules or by binding arbitration administered by an equivalent entity mutually agreed upon by all parties. The disputing party must file the claim with any Washington office of the AAA within 30 business days of the Vice President for Research’s final agency decision, and provide a copy of the claim filing to the Office of the Vice President for Research within the same time. Each party must bear its own costs of the arbitration unless otherwise ordered by the arbitrator. The arbitrator’s decision is final and binding (“final binding decision”). Following the final binding decision, the matter reverts to the OC for standard processing. After the determination by the OC and exhaustion of the employee’s right of internal and external appeal, any employee with an inventorship and/or ownership interest in the IP must execute all necessary OC documents including assignment following standard processing per Section II.D. In the event an appeal results in ownership by the employee, the University shall formally release all claims to the employee’s invention. Once an invention is identified as potentially patentable, premature publication, public use, or disclosure of an invention may jeopardize the rights of the inventor or the University or its assignee to secure patent protection–particularly patent protection in other countries. There must be no publicity or disclosure concerning the invention until patent applications have been filed. The OC must act in a timely fashion not to unreasonably delay inventor’s publications. Persons or entities seeking publicity, public reports, interviews, news releases, speeches, public disclosures, or public demonstrations of the invention subsequent to the filing of the patent application must obtain prior clearance in writing from the University or its assignee. The terms of sponsored agreements that impose different obligations on disclosure prevail over this Section of this Policy. Patent protection, prosecution, and commercialization through licensing are complex and expensive endeavors requiring active participation by the inventors and the University over a period of 20 years after patent filing. For inventions enabled through sponsored research, the federal, state, or private sponsoring agency must be notified and allowed the right to patent the invention. If there was no enabling sponsored research, or the sponsor or the University declines to pursue the invention, then the invention rights are returned to the Inventor. When rights are returned to the inventor, the University retains a license to use the invention in its educational, scholarly, and research activities. All monetary proceeds from commercialization of University-owned inventions are the property of the University or its assignee. The University or its designee collects and distributes royalties, fees, equity interests, or dividends to inventors and the University. The University or its designee deducts the costs of obtaining and maintaining legal protection for each invention to arrive at the “adjusted income,” unless otherwise agreed to in writing by all interested parties. Interested parties may include the inventors, the relevant campus, research unit, or program. The written agreement must be made in advance of an expense or cost being incurred and the OC must approve it. When a written agreement is completed, that agreement controls what expenses may be deducted to arrive at the adjusted income. The OC deducts 20 percent from the adjusted income and the remainder is the “net income.” This deduction covers the expenses, excluding direct patent expenses, for administrative purposes within the OC and for providing initial funds for patent prosecution for other inventions without obvious commercial partners. Distribution of net income must follow the schedules below. 20% To the college and department (or relevant campus, research unit, or program when appropriate) to be equally split between the two. With consideration to other University priorities and policies, the University or its designee distributes one-third of its share to the Office of the Vice President for Research to be invested in further research and technology efforts for the University, one-third of its share to be managed and maintained by the OC as an “Enforcement Fund” to be used for legal claims against University IP, and the remaining one-third of its share to be used by the OC toward a “Commercialization Fund” to be reinvested in commercialization activities and projects. The OC Enforcement Fund allocation is deducted only when necessary to maintain a $150,000 balance for all inventions under this Section. (See Section II.I for information on the enforcement funding for plant varieties). The distribution to the OC Enforcement Fund ceases while the Fund maintains a $150,000 balance and the University share is then distributed equally to the Vice President for Research and the OC Commercialization Fund. Any enforcement expenses incurred above $150,000 are proportionately shared by parties that share in the income for that specific invention and are deducted to meet legal expenses discussed in Section II.H.1.a to arrive at the adjusted income. Any net proceeds, after expenses, resulting from enforcement action (legal damages, fines, royalties, etc.) must first replenish the Enforcement Fund to achieve a $150,000 balance. Any net proceeds remaining are added to the adjusted income. An advisory body, comprised of a representative from each of the inventor/creator/breeder groups contributing to the OC Enforcement Fund and other appropriate faculty and administrators, makes recommendations from the OC to the President on the use of the OC Enforcement Fund. The President may then make recommendations to the Board of Regents who have the final authority to initiate a legal action on behalf of the University. In the event of multiple inventors, the inventors must agree among themselves as to the distribution of the income accruing to the inventors; distribution of the inventors’ share is made only upon receipt of a signed agreement among the inventors. The University or its designee may negotiate, but are not obligated to negotiate, for equity interests in lieu of or in addition to royalty and/or monetary consideration as a part of a license or other agreement regarding inventions or copyrighted works. The University’s designee holds and manages any equity interests acquired. Neither the University nor its designee acts as a fiduciary for any person concerning equity nor other consideration received. If the equity is sold or liquidated, the proceeds are distributed according to the schedule in this Section. The research and development, patent or plant variety protection, and public release of plant varieties requires the cooperation of the plant breeder(s), funding agency (USDA), variety release committees, WSU Agricultural Research Center (ARC), Washington State Crop Improvement Association (WSCIA) or similar commodity groups, and the OC. The distribution of research fees and royalties from licensing or otherwise commercializing protected plant varieties is governed by this Section, including the royalty schedule below. In the case of contracted marketing, licensing, and business development, monies remaining after contractor expenses are distributed to the University. Ten percent of the adjusted income capped at $20,000 per fiscal year per seed propagated variety is retained by the OC as an “Enforcement Fund for Seed Propagated Crops” to be used for legal claims against University IP related to seed propagated crops to arrive at the “Net Income.” The OC Enforcement Fund allocation is deducted only when necessary to maintain a $150,000 balance for seed propagated crops; the 10 percent of the adjusted income distribution to the OC Enforcement Fund ceases while the Fund maintains a $150,000 balance and the adjusted income is then considered to be the net income. Any enforcement expenses incurred above $150,000 are shared proportionately by all parties that share in the income for that specific seed propagated variety. Any net proceeds, after expenses, earned as a result of enforcement are used to first replenish the Enforcement Fund. Any net proceeds remaining after replenishing the Enforcement Fund are added to the adjusted income. Seventy percent of the net income is distributed to the ARC for enhancement of seed propagated variety programs in consultation with the breeders that generated the income for seed propagated crops. In the case of contracted marketing, licensing, and business development, monies remaining after contractor expense are distributed to University. Ten percent of the adjusted income, capped at $20,000 per fiscal year per vegetatively propagated variety, is retained by the OC as an “Enforcement Fund for Vegetatively Propagated Crops” to be used for legal claims against University IP related to vegetatively propagated crops to arrive at the “net income.” The OC Enforcement Fund allocation is deducted only when necessary to maintain a $150,000 balance for vegetatively propagated crops; the 10 percent of the adjusted income distribution to the OC Enforcement Fund ceases while the Fund maintains a $150,000 balance and the adjusted income is then equal to the net income. Any enforcement expenses incurred above $150,000 are shared proportionately by all parties that share in the income for that specific vegetatively propagated variety. Any net proceeds, after expenses, earned as a result of enforcement are used to first replenish the Enforcement Fund. Any net proceeds remaining after replenishing the Enforcement Fund are added to the adjusted income. An advisory body, comprised of a representative from each of the inventor/creator/breeder groups contributing to the OC Enforcement Fund and other appropriate faculty and administrators makes recommendations through the OC to the President on the use of the OC Enforcement Fund. The President may then make recommendations to the Board of Regents who have the final authority to initiate a legal action on behalf of the University. Fifty percent of the net income is distributed to the ARC for enhancement of vegetatively propagated variety programs in consultation with the breeders that generated the income for this category. This Policy applies to establish the rights and responsibilities of author(s) and the University regarding copyrighted works. The OC administers the Policy. The U.S. Copyright Act allows authors or assignees the right to reproduce, distribute, perform, or prepare derivative works based upon a copyrighted work. A copyright is created when an original work of authorship is affixed in a tangible medium on expression. No publication or registration is required; however, registration of a copyright provides the owner heightened legal remedies. Refer to the U.S. Copyright Office at lcweb.loc.gov/copyright/ for further information. Work Made for Hire. Except as otherwise provided in the Faculty Manual or as otherwise provided in University policy, the University owns copyrightable works that are created as a “work made for hire.” “Work made for hire,” as defined by the Copyright Act, includes (a) works prepared by University employees within the employee’s scope of employment, or (b) works not created within the employee’s scope of employment but that are specially commissioned by the University pursuant to a written agreement that is signed by both the University and the employee. Many copyrightable works created in the course of employment with the University are not well suited to commercialization. Additionally, since the University owns works for hire at the creation, payment of royalties to authors is less common than to inventors and may be precluded by state employment law and the Ethics Act. Sponsored Agreements. The University has the right to perform its obligations with respect to copyrightable works, data, prototypes, and other IP under any contract, grant, or other arrangement with third parties, including sponsored research agreements and license agreements. When a work is created in a sponsored program, employees must assign their rights to the University unless otherwise required by the sponsored agreement. This assignment enables the University to meet its obligations under grants and contracts. The employee author owns copyrightable works unrelated to the employee’s University employment responsibilities that are developed on an employee’s own time and without University support or use of University facilities or resources. The University will not assert ownership in copyrighted works in certain situations applicable to University faculty. See Faculty Manual, Section IV.H.2.b Employee Ownership of Copyrighted Works, for details. Students employed by the University in any capacity are covered by the terms of this Policy. In addition, when a student receives financial aid or remuneration under a sponsored research, training, or fellowship program, his or her rights in copyrightable material are limited by the terms of the University agreement with the sponsoring agency. The University has no ownership interest in copyrightable material developed by only students who are not employees unless the University and nonemployee student(s) have a written agreement to the contrary. Some works, particularly certain types of computer programs, may qualify for patent as well as copyright protection. An author/inventor, upon recognizing that one of his or her works is of this kind, must disclose it to the OC. The OC manages it as provided in this Policy and evaluates it for both patent and copyright protection. If the University decides not to protect the patent, that portion of the IP rights may be returned to the inventor. Copyright ownership and disposition is determined under the copyright Section of this Policy. Disclosure. Authors are encouraged to disclose to and work with the OC on copyrightable works which are suitable for commercialization if those works are owned by the University. University ownership is determined based on this Policy, state and federal law, and with respect to faculty, the copyright provisions of the Faculty Manual. A written agreement is needed if the parties wish to make arrangements that differ from those policies. The University determines the ownership in unclear cases following the procedure outlined in Section III.B of this Policy. For general advice and assistance, contact WSU’s Office of Commercialization; Lighty 280, Pullman, WA 99164-1060; telephone 509-335-5526. The University retains ownership of its copyright interests for development by the OC or other University publishing units or colleges, e.g., University Publishing, Murrow College of Communication, Information Technology Services, or Academic Outreach and Innovation–Online Degrees and Certificates. The University may select a managing agent and execute any necessary assignments to the managing agent. Software commercialization through sale or licensing may be complex and expensive requiring active participation by the authors and the University. For additional notice and disclaimer language, contact the Office of Commercialization. The University or its designee deducts 20 percent from the adjusted income to cover the expenses for administering the copyright. The University or its designee reimburses the appropriate University unit, (which is the OC if it has managed the copyright) for expenses advanced to develop and distribute the copyrighted work, e.g., distance learning courseware. The remaining income is the net income. Net income for each copyrighted work is distributed to the appropriate authors and/or creators and/or contributors as identified in the patent royalty schedule in Section II.H of this Policy. In the event of multiple authors, the authors must agree among themselves as to the distribution of the income accruing to the authors. Distribution of the authors’ share is made only upon receipt of a signed agreement between the authors. In the case of authorship or ownership disputes, refer to Section II.E of this Policy. If a University unit manages the copyrighted work, that unit also manages collection and distribution of net monetary proceeds from commercialization. The unit may request and consent for the OC to manage the work, as the OC also manages collection and distribution of net monetary proceeds. Distribution of the University share of the net income from commercialization is governed as outlined in Section II.H, unless all parties make other contractual arrangements. The managing unit or college must be included in such agreements. Generally, the University manages and distributes net monetary proceeds from commercialization of University copyrights, including those managed by an agent other than the OC or a University unit. (University Publications usually manages these responsibilities for works it publishes). If the University has contracted that the works are to be managed by a third party, that managing agent is entitled to deduct its contracted fee from the gross proceeds. It then provides the University with the remaining monetary proceeds. The University share of the net income is governed by Section II.H of this Policy absent an agreement to the contrary. University trademarks include the names, designs, logos, and colors for “Washington State University,” “WSU,” “Cougars,” “Go Cougs,” “Ask Dr. Universe,” and others. Permission of the University is required before use of these trademarks. (See also BPPM 35.10.) Commercial use requires licensing and payment of royalties. From time to time other University trademarks may arise as a result of University research efforts and are registered for software, plant varieties, or devices in conjunction with their patent or copyright protection. These trademarks may generate royalty through commercialization. Net royalty income received by the University or its designee is distributed according to the schedule used for patents or for plant varieties, as appropriate. The University may transmit or reproduce by television, radio, or other means, for local or general distribution, news and general information programs prepared by the University on which employees have appeared. The negotiation of a contractual agreement between the responsible employee(s) and the University is handled through an authorized administrator or the OC as appropriate. Exception: See Faculty Manual for faculty-specific policy. From time to time, the IP arising out of University research is best commercialized through the formation of new start-up companies. University inventors and authors are permitted to participate in such commercialization efforts under the guidelines below and EP27. “Equity” means any relationship between Washington Research Foundation (WRF) or a designee and a third party for WRF or a designee to either own or have the ability to exercise control over an ownership interest in a third party’s company or business when those rights are provided as consideration for the right to use IP owned by the University. It is the policy of the University that in appropriate circumstances, the University authorizes its current designee, WRF, or a future designee to take ownership interests (equity) in companies as partial or full consideration for the granting of a license to IP owned by University. It is the policy of the University to negotiate for license fees and royalties in cash, but in circumstances where negotiating an ownership interest or equity promotes the mission of the University, the University negotiates such consideration within the guidelines in this Policy. Neither the University, nor WRF or any future designee acts as a fiduciary to any person concerning equity or other consideration received under the terms of this Policy. The WRF or the designee may not take an equity position on behalf of the University in a third party without the prior approval of the Director of the OC. The current designee, WRF, prefers to keep its equity ownership at 10 percent or less as of the first major financing event of the company. All shares, warrants, or other instruments evidencing ownership in a licensee acquired by the University under commercial licenses of IP are issued in the name of WRF or a future designee, as provided in the agreement between the University and WRF or a future designee as appropriate. WRF or a future designee manages such equity as described in Section VI.B.5 below. WRF or the designee maintains ownership, custody, and control in its own name of all shares, warrants, or other instruments issued to WRF or the designee. WRF or the designee is solely responsible for voting of and for the transfer by sale or otherwise of such instruments. In particular, it is within the sole discretion of WRF or the designee to determine the time and manner of sale or other transfer of rights in such instruments in consultation with WSU. WRF or the designee has the independent authority to make decisions regarding management and sale of equity in consultation with WSU. WRF or the designee normally requires nonvoting observer rights on the board of any company in which it holds equity. These rights persist for five years, or until such time as the company becomes publicly traded, whichever occurs later. Eligibility of inventors to receive a defined interest in shares, warrants, or other instruments independent of or in addition to the interest granted to WRF or a designee is determined on a case-by-case basis between the inventor and the company. There are no time periods required to vest an interest in equity under this Policy, but the defined interest is determined relative to the value of the shares, warrants, or other instruments at the time of distribution, if any. Distributions of proceeds must conform where practicable, with the appropriate distribution schedule in this Policy (see Sections II.H, II.I, and III.E). Eligibility to receive awards under this Policy is not affected by the inventor’s receipt of consideration from a third party (e.g., receipt of an equity interest in a company formed to commercialize the invention giving rise to receipt of equity by WRF or a designee). Any decision regarding the sale of equity held by WRF or a designee is a decision within the sole management discretion of WRF or such designee in consultation with WSU. WRF or the designee considers the interests of interested parties, including the University, inventors, and WRF or the designee in those decisions. Inventors have no right to direct any action by WRF or the designee in this regard. The University’s mission is to advance knowledge through innovation and creativity, extend knowledge through innovative educational mentoring programs, and apply knowledge through local and global engagement that will improve the quality of life and enhance the economy of the state, nation, and the world. This Policy’s objective is to align the goals and policies of commercialization with the above institutional mission. The goal of the OC is to ensure that innovations, creativity, and discoveries by University researchers are commercialized for the benefit of the public and contribute to the local and global economy. To accomplish this goal, the University has currently allocated physical facilities at its main campus at Pullman (located at 1610 NE Eastgate Boulevard, Pullman, WA, 99163), and the University’s campus at Spokane for use as incubator facilities for startups based on University technology. The University may allocate additional space as it becomes available for this purpose. The University wishes to advance its technology-based startup efforts by lending support in the initial formative stages of its startup companies as outlined below. Before a company/startup is considered for such support the following conditions must apply. Exceptions to this provision of the policy are considered for good cause, but the Vice President for Research must approve the exceptions. Company needs to have a business plan in place for advancing the company. Employee participation in new companies which are created based on University IP is governed by the policy below and is applicable to all employees, except as stated otherwise. University research employees may from time to time create new startup companies based on IP they developed at the University within the scope of their employment. University faculty are allowed to spend their already approved consulting time and outside work hours toward the development of the technology and the advancement of the new venture. For more detail, refer to Faculty Manual. Employees who are not faculty members require supervisory approval for outside activities. Refer to the appropriate employee handbook for details. Employees must conform to the Business Policies and Procedures Manual (BPPM) and the applicable employee manual with respect to working outside their employment and have in place a conflict of interest management plan approved by the Conflict of Interest Committee. This policy works in conjunction with the executive policy on conflict of interest (EP27). See EP27 for more information on the administrative process to manage conflicts of interest related to technology transfer. Information on completing an application and management plan can be obtained from the Office of Research Conflict of Interest webpage. In addition, the following guidelines on technology transfer apply to employees during the term of their participation in a new company that they created based on technology developed by them at the University. A “student” is a current WSU student. WSU employees may not act in a negotiating role for both the company and for WSU in any contracts or agreements involving the entity and WSU without proper approvals and documentation in place to prevent financial conflict of interest (FCOI). A WSU employee may not engage WSU students in their company’s activities without an approved COI Management plan in place if such WSU employee has any evaluative authority (e.g., course grading, member of student’s graduate committee) over those students. WSU employees, if they plan to employ their students in an outside entity, must follow procedures outlined in EP27 (i.e., obtain prior approval by the chair, dean, and Provost). May not be transacted while the employee is acting in a WSU employee role and supported through the use of any state resources. WSU employees cannot engage WSU students in investment opportunities involving their company without proper approvals. WSU employees may not be able to sole-source contractual work to their startup companies except on a case-by-case basis. Use a Facility Use Agreement. (Note: This option does not cover use of WSU personnel.) See also BPPM 10.11.